Over the last number of years, litter size has improved dramatically which has had a significant impact on piglet birth weight. It has been claimed that every extra piglet born reduces the average piglet birth weight by 40g. The lower the birth weight, the less chance of survival. 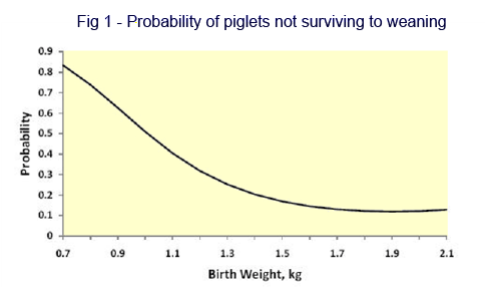 It is clear to see in figure 1 when birth weight drops to less than 1.3kg, there is a steep increase in the probability of piglets not surviving. This increase in litter size puts a lot more pressure on the sow and the production of smaller piglets emphasises the importance of adequate nutrition. The number of piglets on the sow will be a driving factor when deciding when creep feeding is required to optimise growth as the sow can only produce a finite amount of milk. Table 1. specifies that if there are 9 or more piglets on the sow then it is crucial to introduce some creep, with differences in weaning weight of almost 0.5kg being observed. Creep feeding is introducing solid feed to the piglets while they are still suckling the sow, preparing their digestive system for weaning. Piglets move from a total milk diet onto creep containing "vegetable protein" which they have never had to digest before. It is crucial that all piglets have consumed some creep pre-weaning to ensure their digestive system is ready to cope with utilising the solid feed. It is beneficial that the exact same diet that was fed in the farrowing room is continued to be offered post weaning ( 4 days) to ensure the feed is familiar when everything else around them is changing. It is crucial to ensure feed intake continues throughout the weaning process. If feed intake drops or stops during weaning it results in severe growth check. If the piglet doesn't eat then the production of digestive enzymes decreases dramatically as well as having a dramatic effect on the villi resulting in significant reductions in absorption and diarrhoea (Figure 2). Selection of product and the timing of introduction is critical in ensuring success in creep feeding. An on-farm feeding trial has shown the difference in the selection of the initial creep offered. Specific high-quality pre-starter ration was fed from day 10 followed by a standard creep ration for the last 7 days prior to weaning. The high-quality pre-starter resulted in an increased weaning weight of 0.57kg with a carryover effect resulting in 0.9kg differential at 24 days post weaning. What is key to note from the figures below is the differential in the feed intake observed (411g vs 280g) confirming the fact that ensuring consistent intake by the piglet significantly improves performance due to the avoidance of the growth check. What does that Weaning Weight Differential mean? What we have measured from this trial and know specifically is that there is a 0.9kg difference observed at 24 days post weaning due to the high quality pre-starter being fed. Assuming this has set their growth trajectory curve and using the Devenish weight for age chart (growth rate from 24 days to 115kg (set by the effect of their weight at 24 days on growth rate) of the pigs should be = 805g/d vs 954g/d). Therefore, feeding a high-quality pre-starter correctly has the potential of reducing the time to a finish weight of 115kg by 16days! At A-One we take your personal preferences into account before sending you information about our products or services, please select the channels you would like us to contact you by.